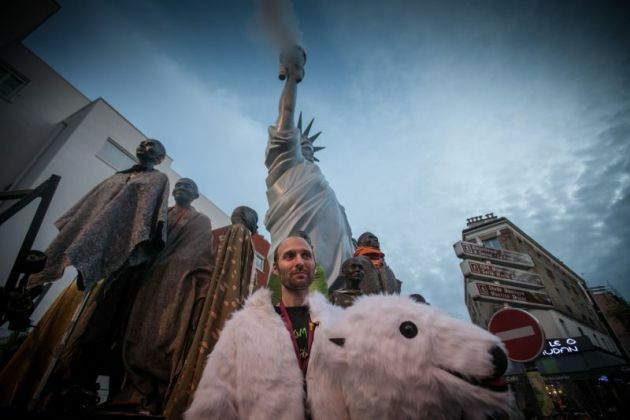 (Photo: © Sean Hawkey / WCC)A statue of liberty and a polar bear in a public stunt during the UN climate talks COP21 in Paris in 2015. Church-backed groups and international Christian organizations have expressed dismay at U.S. President Donald Trump's announcement that the United States will withdraw from the Paris accord on climate change saying it flies in the face of Christian values. Faith groups across the spectrum said the action by Trump is irresponsible and will hit poorer people hard. Trump also rasied the ire of many world leaders and those concerned about the future of planet earth, commiting what amounts to an act of 21st century heresy. All but two countries, Nicaragua and Syria, signed the agreement. But Trump in making his announcement to the world said the deal puts the United States at a disadvantage. "The United States will withdraw from the Paris climate accord," Trump said June 1, "but begin negotiations to re-enter either the Paris accord or an entirely new transaction on terms that are fair to the United States." The Paris accord had several ambitious goals. Signatories agreed to do their part to reduce greenhouse gas emissions and keep the world's temperature to just 1.5 degrees Celsius above what it was before industrial production took root. When the U.S. President met Pope Francis at the Vatican, last week, "it was as if they were members of different species, so far apart in values and style that the actual content of what separated them proved elusive," commented The New Yorker on June 2. "Francis slyly presented Trump with a gift, though, that...defines their opposition as absolute. The gift was a copy of his encyclical on climate change, 'Laudato Si.' Trump politely promised to read it. Sure," noted the magazine. "This is a tragedy, missing an opportunity to show real, accountable leadership for the future of humanity and our common home," said World Council of Churches general secretary, Rev. Olav Fykse Tveit. "This is a decision that is not morally sustainable - and not economically sustainable either. The struggle for climate justice has to continue." The ACT Alliance, the Lutheran World Federation and the World Council of Churches, are calling for a prioritization of climate justice as US President Donald Trump issues executive order withdrawing the US from the Paris Climate Agreement. They expressed deep dismay at this development, which goes against global commitments to address climate change. The three faith Christian bodies actively contributed the development of the Paris agreement, welcomed its outcomes and the commitments of the nations of the world to it. "Only 18 months ago global leaders welcomed the landmark Paris Climate Agreement for taking into account the immediate needs of countries most severely affected by the impacts of climate change. "The move by the President of the United States today flies in the face of ethics and Christian values," said Rudelmar Bueno De Faria, ACT Alliance General Secretary. Lutheran World Federation general secretary, Rev. Martin June said, "Addressing climate change equals protecting human beings, their workplaces and the economies of the world. The LWF will continue to promote climate justice, as an issue of intergenerational justice, in the conviction that creation is not for sale." says Martin Junge, LWF General Secretary. As global temperatures continue to rise, severe floods, droughts and superstorms are becoming more and more commonplace. It is the most vulnerable people who are hit first. The poorest countries will be hit twice more: first by unwillingness to curb US carbon emissions, and then by a planned decrease in climate finance to support people in adapting to the impacts of climate change and towards a transition to clean energy for poor countries. The implementation of the Paris agreement is the only way for the human family to turn away from the threat of global warming. ACT, LWF and WCC affirm their commitment to climate justice and call on the nations of the world to stand by the commitments of the Paris Agreement. Rabbi Jonah Dov Pesner, director of the Religious Action Center of Reform Judaism, issued a statement on behalf of the Reform movement saying the announcement was "an abdication of responsibility to address global climate change and is both physically dangerous and morally reprehensible. "The decision disregards vitally important environmental efforts to protect both our planet and the population, with consequences that will reverberate for generations," wrote Pesner, the Jewish Telegraphic Agency reported. "Reneging on the agreement diminishes U.S. leadership and undermines longstanding alliances, placing an undue burden on other nations to address climate change." American Jewish World Service, which advocates for people in developing nations, said such countries would bear the brunt of the severe storms, flooding, droughts and famine that a scientific consensus regards as the already apparent signs of the effects of man-made global warming. "The longer the U.S. denies climate change and fails to take responsibility for its outsized contribution to global warming, the greater the risk posed to the entire world, especially the poorest people on Earth," said Robert Bank, president and CEO of AJWS, in a statement.